What could be more comforting on a cold, blustery day than a piping hot bowl of an amazingly tasty soup? 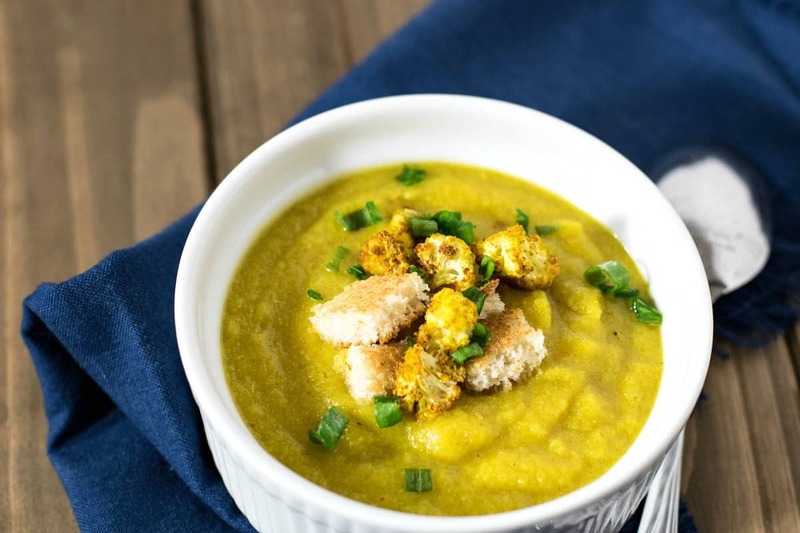 Not just any soup mind you, but this delicious AND healthy Vegan Roasted Cauliflower Soup! Why is this soup so healthy you ask? First off, there’s absolutely NO oil in the recipe at all. Regardless of what you may have been taught, you can perfectly roast vegetables, even whole heads of garlic without it. I’ll show you how in this recipe. Next, there are no dairy products used in this recipe either. No milk, or creams. Not even any nuts, so it’s naturally low-fat soup for those watching their weight. So how do I get it so creamy? I added a Yukon Gold Potato to the soup and allowed it to get nice and tender before pureeing. Yukon Golds have a naturally creamy texture that accompanies the cauliflower perfectly. Speaking of Cauliflower…… this is really the star of the show. Cauliflower has so many health-benefits I would need an entire blog post to list them. Eating cauliflower also helps reduce inflammation, decreases your risk of heart disease and brain disorders, has a ton of vitamins and minerals, is naturally cholesterol-free, has only 29 calories per cup, is full of fiber……. You get the picture. 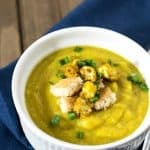 Cauliflower is truly a superfood we need to eat, so let’s quit jawing and make some soup! Start with a medium sized head of Cauliflower (about 3-4 cups). Cut off the outer leaves and remove the stem, and then cut the individual florets. Try to get as many of the florets the same size as you can. Don’t throw away those little crumbles! We’ll roast those too and use them as a topping! Place all your cut Cauliflower pieces into a large zip-lock baggie. Roughly chop about ½ of a yellow onion and place those pieces in the bag too. Finally, we’re going to season the cauliflower with 1 Tbs of Curry Powder and ½ tsp of Ground Cumin. Add a pinch of salt too. Just dump the spices right into the bag with the veggies and give it a good shake. Dump out the coated veggies onto a parchment-lined cookie sheet and preheat your oven to 425° F.
Next, we’re going to prepare our garlic. Take an entire head of garlic (no worries – roasting garlic will mellow its flavor) and cut off about ½” of the top so that all the individual cloves are exposed. Remove any loose papery skin and place the garlic, cut-side down onto the baking sheet with the cauliflower and onion. Roast the veggies for 25-30 minutes or until they turn a nice golden brown. Carefully remove the veggies and place them into a large soup pot. The garlic will be hot, so carefully squeeze the garlic out of its skins. I used the side of my knife. The cloves should be nice and soft and slide right out. Add the garlic to the pan with the veggies. Last but not least, we’ll peel and cube our Yukon Gold Potato and toss him into the party mix too. Now we’ll add 3 cups of Low Sodium Vegetable Broth, 1 cup of Water, ½ Garlic Powder, ½ tsp Onion Powder, ¼ Salt, ¼ tsp Black Pepper (if you’re showing off to family or friends – maybe use White Pepper instead), and just a scant pinch of Ground Thyme. Give that a stir and bring the whole pot to a boil. Once that happens, lower the heat to a simmer and cover for 5-10 minutes – or just until the potato is fork tender. All that’s left is pureeing the soup. I used my immersion blender but if you don’t have one, carefully transfer to your blender and puree it there. Adjust for seasoning (mine definitely needed more salt) and serve. For garnish, I like to toast a piece of bread and cut it into croutons. And don’t forget those crispy little Cauliflower Crumbles either, those add a nice touch. Maybe add a little chopped green onion or parsley, and break off a piece of a warm baguette and dinner….is…..served. Delicious, healthy, easy to make…… what could be better? 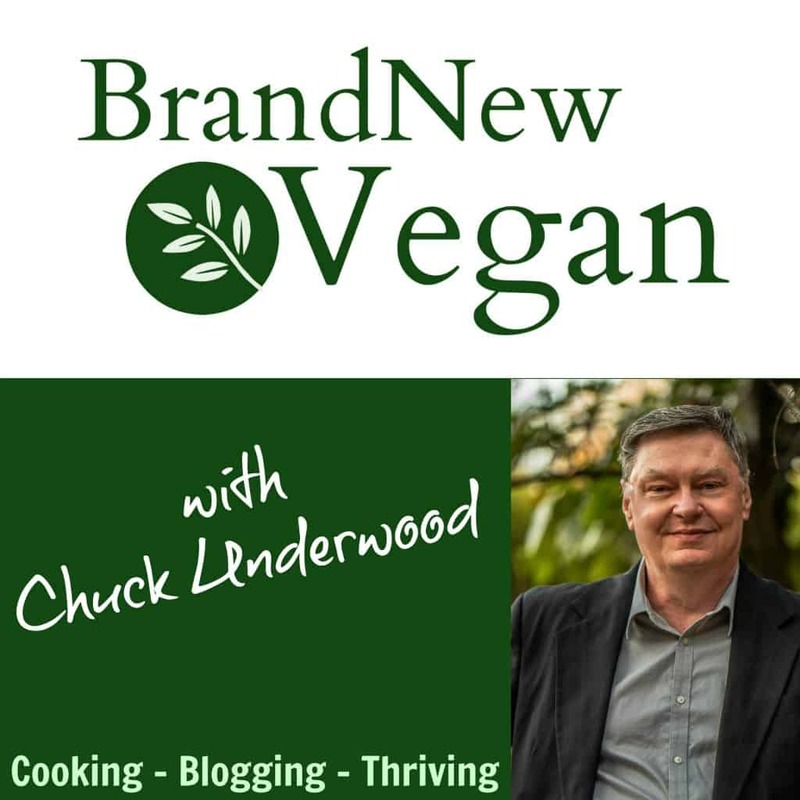 Thanks for hanging out with me and until next time…..
Next up….I have been challenged by my readers to make a Vegan version of a Kentucky Hot Brown…..should be interesting! What could be more comforting on a cold, blustery day than a piping hot bowl of an amazingly tasty soup? 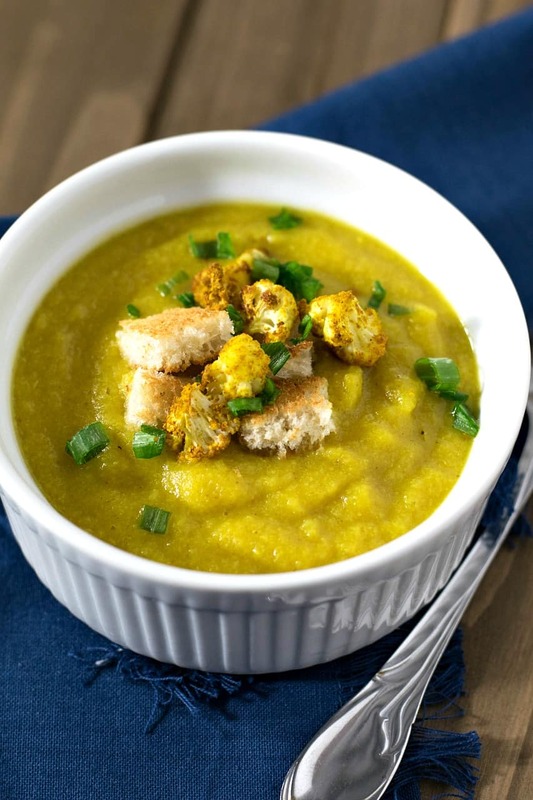 Not just any soup mind you, but this delicious AND healthy ... Vegan Roasted Cauliflower Soup! Remove outer leaves and stem from cauliflower and cut into equal sized florets. Save the smaller crumbles - don't throw those away! Cut the top 1/2" or so off the entire head of garlic, exposing all of the individual cloves. Place cut side down on a parchment-lined baking sheet. Rough chop the onion and add to a large ziplock bag, along with the cauliflower. Add curry powder and cumin and shake to distribute. Arrange the veggies on the baking sheet and roast in a 425 degree oven for 25-30 minutes. Carefully place the roasted veggies into a large soup pot. Carefully squeeze the garlic cloves out of their skins and add to soup pot. Add broth, water, the potato which has been peeled and cubed, and the remaining spices to the soup pot and bring to a boil. Reduce heat to a simmer and cover for 5-10 minutes or until the potato is tender. Puree the soup with either your blender or an immersion blender until smooth and creamy. Garnish with toasted croutons, the cauliflower crumbles, chopped green onions, or parsley. Do you have any tips for making this using frozen cauliflower instead of fresh? Great recipe! Looking forward to trying it. I wouldn’t use riced cauliflower, I’m afraid the little pieces would roast way too quickly and unevenly. Cannot wait to try this. Thanks for the good tips!! Frozen cauliflower can be roasted also, 400 degrees 20-30 minutes, stirring halfway through. Anyone try roasting the cauliflower in an air fryer?